So, this particular recipe is the result of many manipulations and modifications to various recipes. We are pretty sure that we have created the perfect balance of flavors, with a little crunch from the pecans, all topped off with a creamy icing. What better way to get your vitamin A and satisfy your sweet tooth at the same time but with a hearty slice of carrot cake! 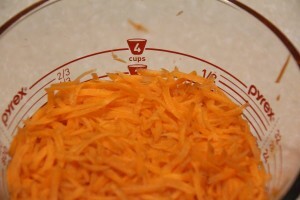 Grate 1 pound of carrots, which will give you about 3 cups of shredded carrots. I like to use the food processor to make the grating process fast and easy. 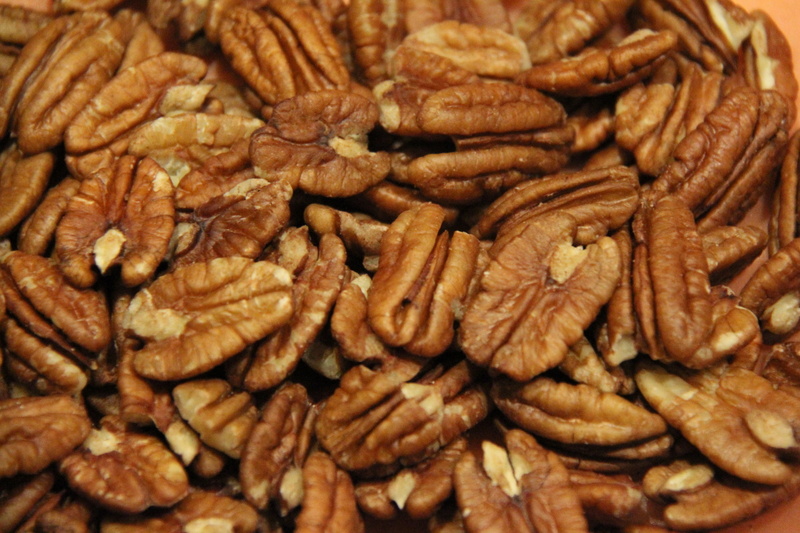 The other ingredient requiring minor prep work is pecans. 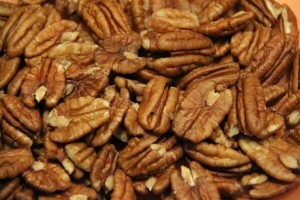 I use a knife to coarsely chop the pecans and create big, hearty chunks. 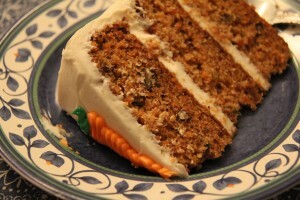 If the pieces are too small, you will loose that wonderful, nutty crunch in the final cake. 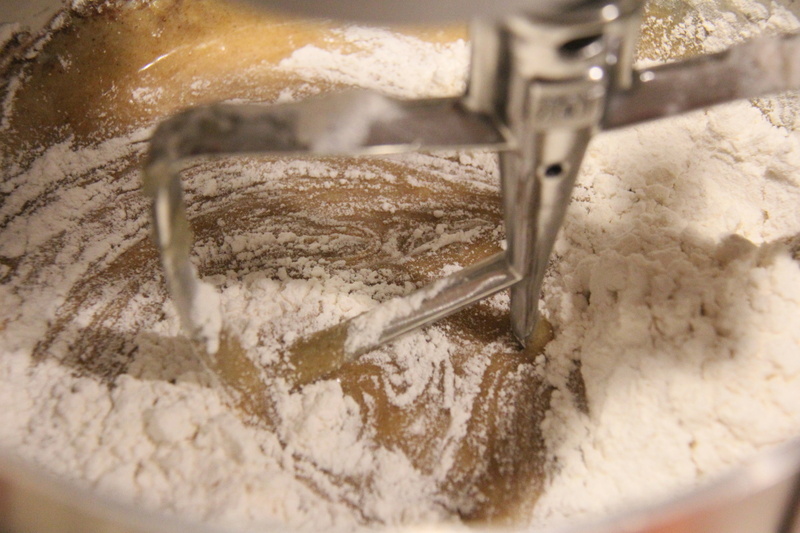 In a mixer, combine the sugars, oil, applesauce, and eggs. Beat for a few minutes until creamy. Add the next 6 ingredients, and mix until fully incorporated, scrapping down the sides of the bowl. Finally, add the carrots and pecans. 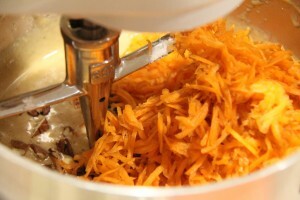 Depending on your mixer, you can continue to beat for about 30 seconds or switch to mixing these ingredients in by hand. Pour the batter into the 3 prepared pans and bake for 25 to 30 minutes or until the tops of the cakes bounce back when lightly pressed. Let the cakes cool in the pans for about 10 to 15 minutes. After the initial cooling, I find it helpful to run a knife around the perimeter of the pan first, flip the cake onto your hand, and then place it on a cooling rack. 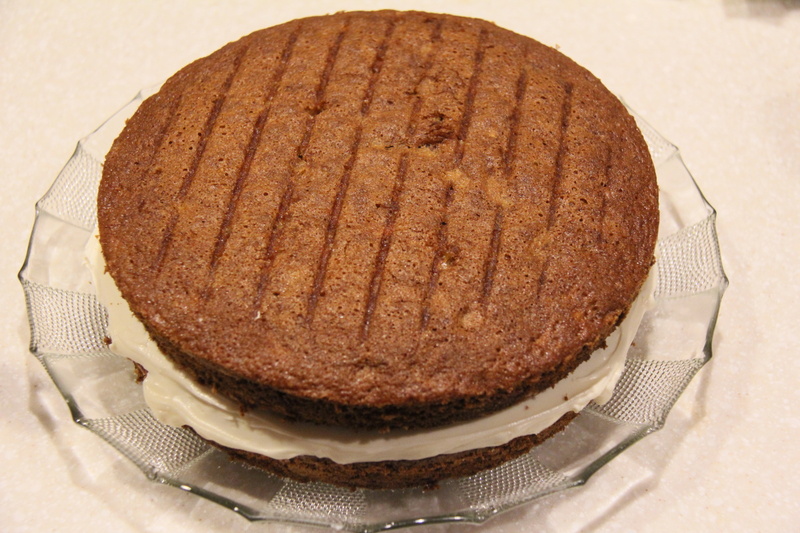 Don’t forget to remove the parchment paper from the bottom of the cakes. 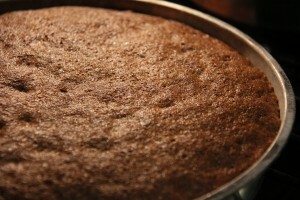 Let the cakes cool for 1 or 2 hours before assembling the final cake. The lines you see in the photos on top of the cakes are due to indentations from the cooling racks. 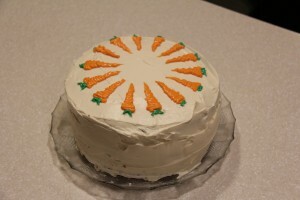 I like to cool the cakes upside down to help flatten the tops a little. I think this helps the layers to stack better. 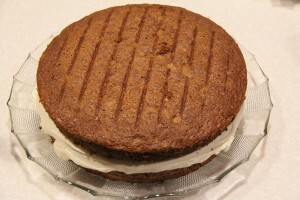 Wait to make your icing until the cakes have cooled for a couple of hours when you are ready to assemble the cake. First, cream the room temperature butter, cream cheese and vanilla for a minute or two. Then, add the powdered sugar and beat at a high speed for 3 to 5 minutes until the icing is fluffy. Now, we are ready to assemble! Place the first cake layer on your serving dish. Sometimes, I like to sprinkle a little bit of granulated sugar on the serving plate before placing the first cake down so it doesn’t stick. 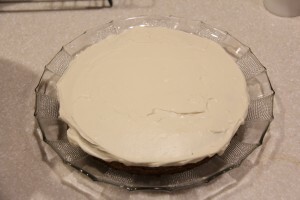 Then, place about 1/4 of the icing on top of the first layer cake. Smooth the icing around evenly to cover the cake, trying to keep the surface as flat as possible. 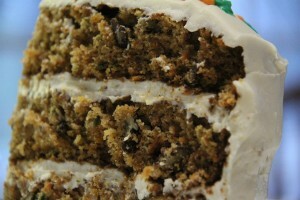 Add the second layer cake and another 1/4 of the icing, spreading it around just like the first time. Finally, add the third layer cake and use the remainder of your icing (minus a few Tablespoons of icing if you want to draw carrots!) to cover the top and sides of the cake. Here’s how we make the carrots. Place about 2 Tablespoons of reserved icing in a small bowl. Add 3 drops of red food coloring and 8 drops of yellow to produce the orange. Likewise in another bowl, reserve about 1 Tablespoon of icing and add 4 – 6 drops of green food coloring. 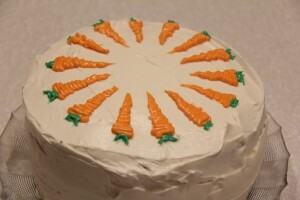 You can use a piping bag to decorate the carrots on the cake, but with such small amounts (and to make cleanup really easy), I prefer to use zip-lock bags. 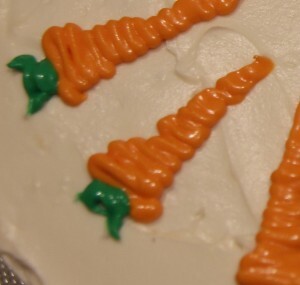 Transfer the icing into two small zip-lock snack size bags and cut off one corner to make a 1/8″ hole. 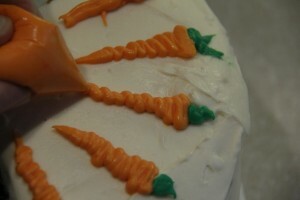 Squeeze the orange icing into the carrot shapes, wiggling back and forth to give a little carrot texture. Then, top your carrots with a couple little green leaves! 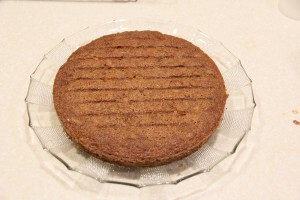 Chill the cake for at least an hour or two before serving.